SAN DIEGO — Did you catch the recent reports about a San Diego-based fishing boat’s dramatic rescue of 15 passengers from a boat explosion off the Baja coast? After reading rescue coverage and watching online videos, one thing struck me: the crew of the 42-foot Time Machine, father-and-son team Mike and Reeve Koesterer and crewman Andy Vo, did everything right. They achieved a textbook rescue, saving so many lives, although all regret the three lives lost to fire or drowning. The Coast Guard agreed, telling Mike, who was at the helm throughout the rescue effort and first spotted the explosion’s orange flash 4 miles away, that if they hadn’t been there, everyone on the boat would have died. Curious about the crew of Time Machine and their background, I found them online through Pacific Bluefin Sportfishing and called to arrange an interview. I discovered I had met Mike previously at a port district meeting focused on reining in and regulating illegal charters. I recalled him as a passionate advocate for appropriate licensing and inspection for all boats offering charters or tours to paying passengers. He and his crew performed superbly in a crisis tracked with my previous impression. 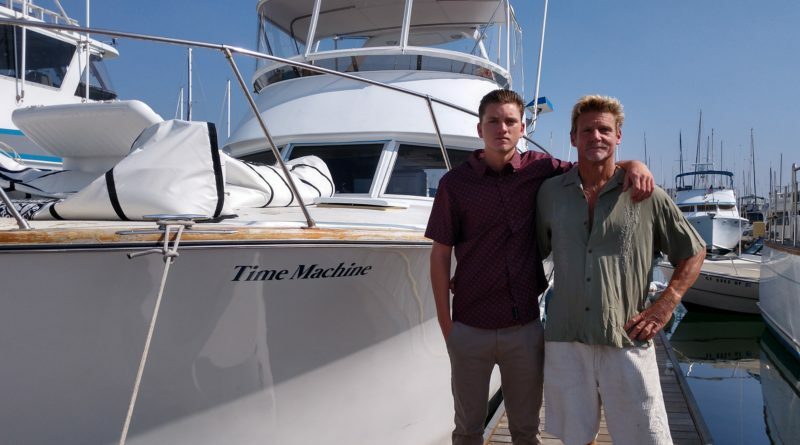 Both Mike, 53, and his son Reeve, 19, who operate Time Machine as a family-run fishing charter boat, grew up on the water, splitting their time between San Diego and Ensenada, with ties on both sides of the border. Mike’s family, including prominent tunaman Rod Beeche, docked purseiners at Tuna Harbor, back in the day. Mike started crewing on family fishing vessels by the age of 15. Later, he ran fishing charters from Ensenada. “As a child I was brought into fishing and boating by family. I learnt everything I know about boating from Ron Post,” his uncle and creator of “Introduction to Boating” courses, he explained. It’s family he credits with training him to operate, maintain and repair boats, training he’s passed along to his son, whom he introduced to boating at age 5. Reeve, Mike proudly boasts, qualified for and obtained his 100-ton master’s license on his 18th birthday. Part of that training, he said, includes conducting regular safety and man-overboard drills on their vessel so they’re prepared for any eventuality. Those drills kicked in like clockwork on Saturday, Oct. 20. Time Machine was returning to San Diego from a crew pleasure cruise when he saw the orange explosion. Having heard radio chatter about man-overboard drills, Mike called the Coast Guard, learned this was not a drill and raced to the scene to conduct a rescue. For the next hour or so, while Mike drove the boat, keeping its props away from the people in the water, Reeve in his wetsuit jumped into the water to pull people aboard to safety, with Vo receiving them and documenting the rescue. Once the Coast Guard helicopter arrived to evacuate the two severely burned passengers, Mike skillfully followed instructions, correctly positioning the boat underway at 7-8 knots, which he did for the 45 minutes required to lift them up. This is not Mike’s first life-saving effort. As a volunteer firefighter in Ensenada he gained “a lot of rescue skills” and learned about fire, saving a group of 12 university students from a blaze. On another occasion he spotted a couple in distress when their boat capsized and dove in to save them. Why rush to the scene of the explosion? “I knew there was someone on that boat and they needed help. And we knew that we could help them,” Mike explained. The lesson for us all: develop skills and be prepared for the unexpected. This is a great article. It would be helpful to include a link to steps boaters should take in an emergency. Thank you, Nicole, for providing coverage of this important rescue. G-d Bless Mike, Reeve and Andy for their brave and professional response to this crisis. It’s sea-men and sea-women like you who give hope for humanity on the high seas.